Many Mormons, (not all) today justify the massacre by pointing to the alleged atrocities against Mormons committed by non-Mormons in Missouri and Illinois . Read the history of the Mormons in Missouri and Illinois, and come to you're own conclusions! AMOS G. THORNTON, a MORMON SHOOTER and CLUBBER; was a sergeant of a militia platoon in Pinto, nominally attached to John D. Lee's 4th Battalion; (son of Oliver Thornton and Mary Griswold) Born: 30 Oct, 1832, Pickering, Ontario Co., Canada. On Sunday, September 6, 1857 Thornton and two other unidentified militiamen visited the emigrants at Mountain Meadows. 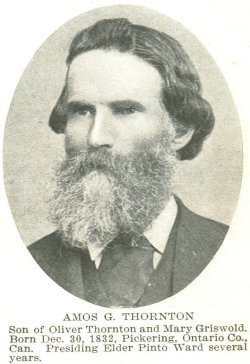 According to Richard Robinson , Amos Thornton delivered an express to Pinto shortly after the emigrants had passed. Joseph Clews/Clewes recollected that on Monday, September 7, he carried an express from Cedar City to Pinto which he delivered to Richard Robinson or Amos Thornton. Thornton rode southwest along the trail from Pinto to Mountain Meadows, intent on delivering a "cease and desist" order to John D. Lee . However, Thornton failed to encounter Lee at Mountain Meadows. Lee had rode south in search of the militia detachments from the "southern settlements," Fort Clara and Washington. "Thornton" was named in the Judge John Cradlebaugh's 1859 arrest warrant. Thornton was also identified in T.B.H. Stenhouse's Rocky Mountain Saints whose list of participants followed the 1859 arrest warrant. Married Mary Whittaker Dec 18, 1856, Cedar City, Utah, (daughter of James Whittaker and Rachel Taylor of Cedar City—pioneers 1852) She was born Nov 18, 1838 Their children Mary Alice b July 29, 1858, Amos Whittaker b Oct 10, 1860, Lydia Meacham b Aug 22, 1862, m James G Knell, Oliver Griswold b Nov 15, 1864, Rachel G b April 6, 1867, Ellen Lunt b Feb 18, 1870, m J Granville Pace, Sarah May b May 1, 1873, m Joseph D Cox, Jr , Hattie Maria b Dec 2, 1875, m William J Snow, James Whittaker b Dec 9, 1883, m Matilda Grace Green, m Nellie Schoneld Family home Pinto, Utah. Married Charity Butler (Wallace) 1862, Salt Lake City, (daughter of John Butler and Caroline Skeen of Spanish Fork, Utah—pioneers 1852) Their children John L b Aug 3, 1863, died, James Apollos b Dec 23, 1864 Amos, Edmund T b Jan 8, 1867, m Jennie Cox Sept 22, 1896, Lydia Adeline b Jan 19, 1870, m Hezekiah E Duffln Sept 22, 1896 Artimesia b. Oct 6, 1871, Taylor Butler b March 3, 1873, Family home Pinto, Utah. Charity Butler was the widow of Mr Wallace The two children of her first marriage were Caroline M , m Dagbert Whipple, Hamilton Monroe, m Jane Stapley. Information on the above Mormon Shooter and Clubber, was obtained from the following: Pioneers and Prominent Men of Utah, and The 1857 Iron County Militia Project.